The audience I chose ranged between older teenagers up until young adults those that are studying, at uni or just trying to make there way in the world, the way my magazine has been created is sure to attract them into buying it. My magazine is aimed at both a male and female audience I have made sure this is the case by featuring male and female bands in my magazine. 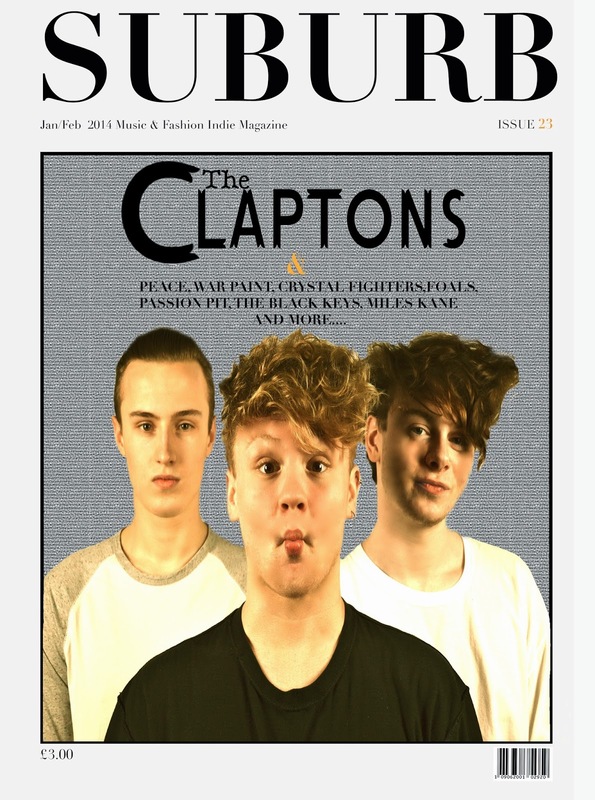 The bands and artists that have been used in my magazine are all within the age range of my target audience which makes it easier for the reader to relate themselves too which will attract them into buying my magazine. I made the artist relatable to the audience by the way they look their hairstyles the poses they are pulling and the clothes they are wearing. the writing on my double page spread was written to feature experiences that may be similar to the ones in which my target audience have had or wish to have. My cover line featured in the contents page features more male than female artist as it features one male band one solo male artist and only one female duet but this isn't really an issue as many of my target audience especially the female reader would find the artists featured atheistically pleasing yet different which is exactly what I am trying to portray in my Indie music magazine as my target audience is Indie Scenesters. All the Artists featured originate from within the UK which obviously limits the range in which my auidence can possibly be but this is how I intended it to start out, if my magazine became bigger then foreign artist would be featured as I would be aiming to expand my audience across the world. Although by using artists that all originate within the UK it will attract the interest of the reader as they will be more interested in what is happening in this country music wise than others along with the fact that by including all british acts then there is more chance of them doing concerts tours and gigs which will instantly attract the audience into buying my Indie music magazine. 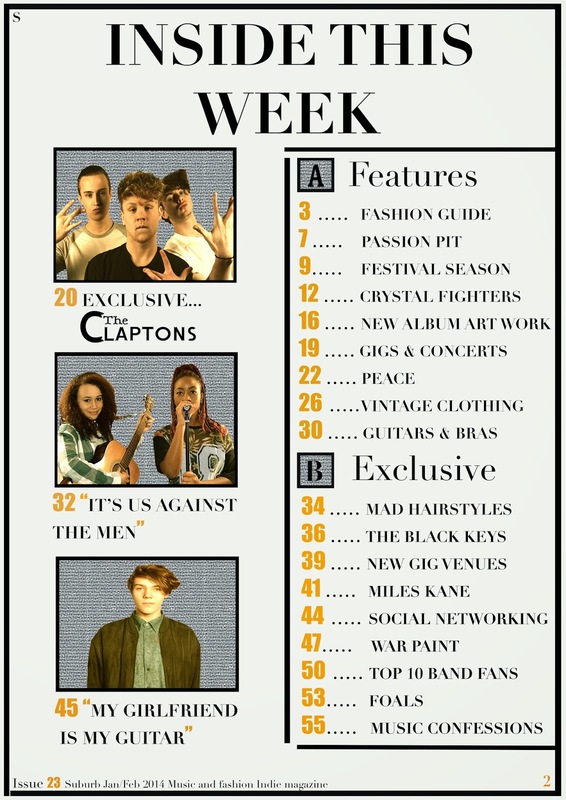 My Contents contains 3 main features that were used from adapting conventions of other magazines and these are page 9 festival season, page 19 gigs and concerts, and page 39 new gig venues the use of these in my contents has been adapted from magazines such as NME, Mojo and Q. The contents is specifically designed for my audience because the language used is of a medium complexity which should be more than fine for my target audience to digest relating to the genre of music. The context and language used throughout my magazine would be sufficient for the audience and will provide them with a flowing read which will attract the audience into purchasing the magazine. This magazine would appeal to my target audience because all of the artists featured are within the range of the target audience which will attract them as they can relate themselves to the artist and aspire to be like them. 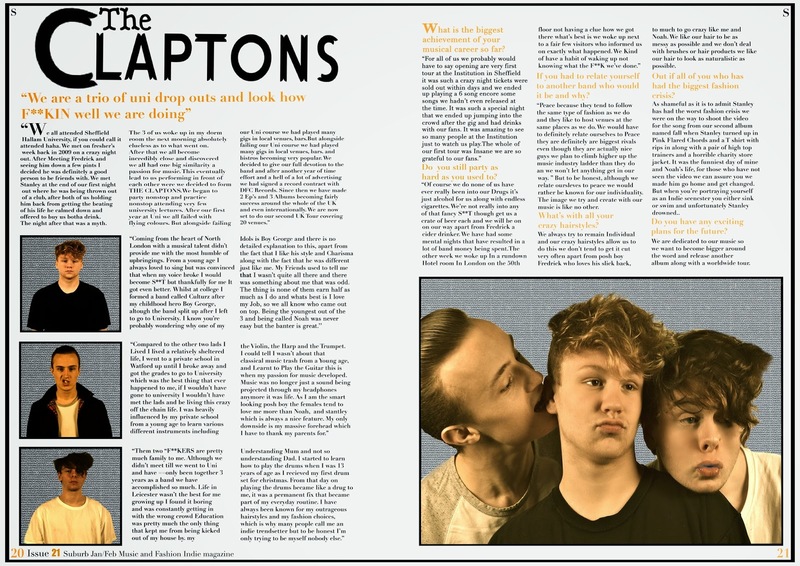 The experiences and stories that my band the Claptons exclusively reveal will make the target audience relate to similar experiences they have had with partying and education which will provide the audience with an attraction into buying the magazine. The other bands I have featured in my contents are used to attract the audience as I have made sure the bands I have used would strongly appeal to the Indie Scencesters that are my target audience these Indie bands contain a mix of males and females to appeal to both genders. The photography featured in the double page spread will appeal to the audience as then photos tend to be out there and edgy especially the photos that cover the Claptons as ear biting and odd hand gestures will appeal to the Indie Scencesters out there as some of my Indie scencesters friends were highly amused by the photos that were presented in the magazine. The mast head of the Claptons was chosen as it would appeal and attract the audience as a lot of Indie bands have their names in obscure of odd looking fonts with strange layouts, so by doing this I thought it would fit in with the intended design and style. The fact that I presented my magazine as a music and fashion magazine advetising vintage clothing will appeal hugely to Indie Scencesters as these are two of things that these scencesters are interested in combined into one magazine. On the whole I believe that my magazine contains numerous things that attract the audience in the correct way that will lead them to buying and subscribing to my magazine, The ways in which I have done this are to include features that will solely appeal to the target audience. The way in which my magazine was presented was essential in attracting the target audience. I based a lot of the content and research based on several of my friends who are Indie scencesters along with other information present on the internet to ensure everything was designed and presented just right.